A few weeks ago we were up in Connecticut. The week started with 65 degrees and raining, finishing the week with 95 degrees and full humidity. The Wilton Historical Society had their annual meeting and pot luck dinner during the latter part of the week. It was stinking hot that evening and the meeting was held under a tent. It turned out to be a most enjoyable evening – maybe it was the company, but the food was great. Check out their website, www.wiltonhistorical.org . It has been my father’s passion for many years, saving historical buildings by dismantling them and bringing them to the Historical Society property. His pride and joy is a circa 1860 hay barn – a hand hewn Chestnut beamed, timber frame structure once belonging to our uncle, George Abbott. In this barn is a portion of my father’s antique tool collection highlighting the past industries of Fairfield County. A truly top-notch exhibit so beautifully displayed. This is what my mother and I brought to the meeting – keep the salad ice-cold and dress right before serving. 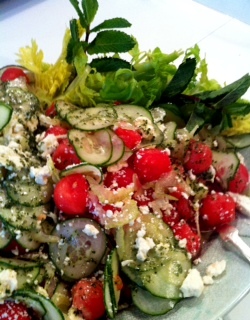 This entry was posted in Collecting, Family, Recipes and tagged celery, Cucumber, feta cheese, Honey, lime, mint, Summer Salad, Watermelon. Bookmark the permalink.